Step aside Philip Plein is here to save NYFW. Even though I heartbroken that I haven’t invited to high tech savvy runway show (technology blogger speaking. Duh!!) you can’t believe how happy I am that we have a designer in the town to save the emptiness of NYFW. 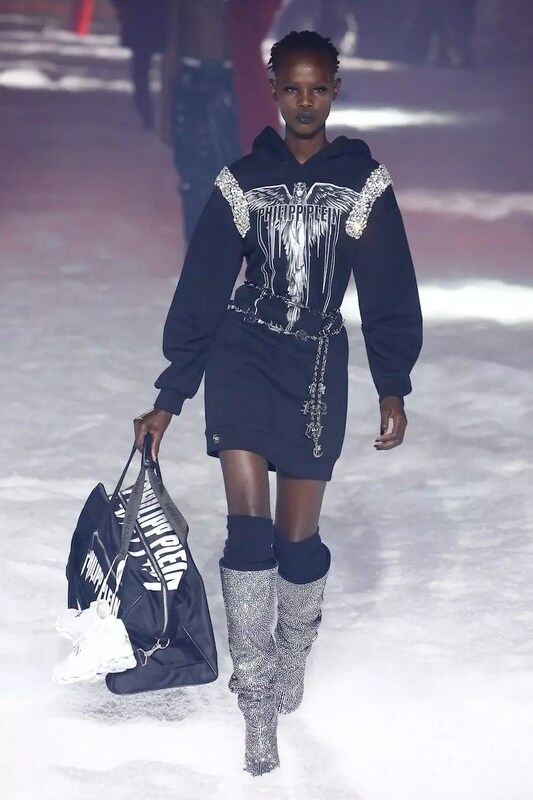 Buckle your seat belt, here is NYFW Philipp Plein 2018 Fall Collection Review by Alley Girl. He is everything that you asked for a modern-day designer. Kudos to her model recruitment, his team made a perfect picking and styling you don’t feel like they put some normal size* models here and there or black models to make a statement. This guy doesn’t need that. All those runway people** make perfect sense. You can argue about the creativity here but we have to admit that he has the far best show an entire fashion week so far. Even though I am not this adventurous on my style options, I love the styling of this show to the moon. I can definitely see myself in this jacket with a pair of skinny jeans. I think I can be very cool with this total look when I am going to my ski trip in Europe next year 😉 I am a huge fan of slouchy boots and over knee socks. But I didn’t like the boots from sides. I believe he added the logos to make difference with YSL’s $10000 worth boots. But It’s too many logos going on here. Perhaps that’s my only criticism over the collection. Stop logomania now, please. If this is all too grunge for you, how about these sheer stoned boots. I know you start to dripping, I know I am! Before you go take a look at Tory Burch Review and Alexander Wang. *I don’t like this statement as skinny girls have don’t normal size. “Normal size” is a debatable thing. ** Yes I said “runway people” instead of saying model, because the whole crew looks very naturally coming together.